Devi (Chennai, India) on 25 March 2019 in Lifestyle & Culture and Portfolio. The floral design created with petals from various blossoms. Lamps are arranged on these and also a decorated small brass pot - having water inside, a few mango leaves and a coconut. I could not avoid the two feet that are visible...as I had no guts to tell him to move away, when I took the image ! I thought he will move away, seeing me holding the camera..but he did not ! Aw!!! Somethings have to be endured ! What a wonderful presentation those petals make . . The photo always tells the moment the picture is taken. Maybe he wanted to be your picture. Thrill is beautiful. there has been tremendous work in doing it. I bow to the author. @Jypyä Pop: aHa ha ha !! Only his legs got into my picture !! Yes..The hotel staff did this !! Great pattern here ! Ce type de décoration est unique et ancestral je crois en terme de méthode.Sublime. Very nice and colorful deco. This is very beautiful and special. Great picture have you made. Very beautiful colours and patterns ... never mind the legs! @grouser: Thank you Grouser:) There was nothing where I could perch myself like a monkey and take a nice shot with the tops of all the lamps !! Thanks for your explanations. They are very interesting. The image is of great beauty. Beautiful decorations with flowers . @Gigisis: I am taken back down the nostalgic path to our childhood days. 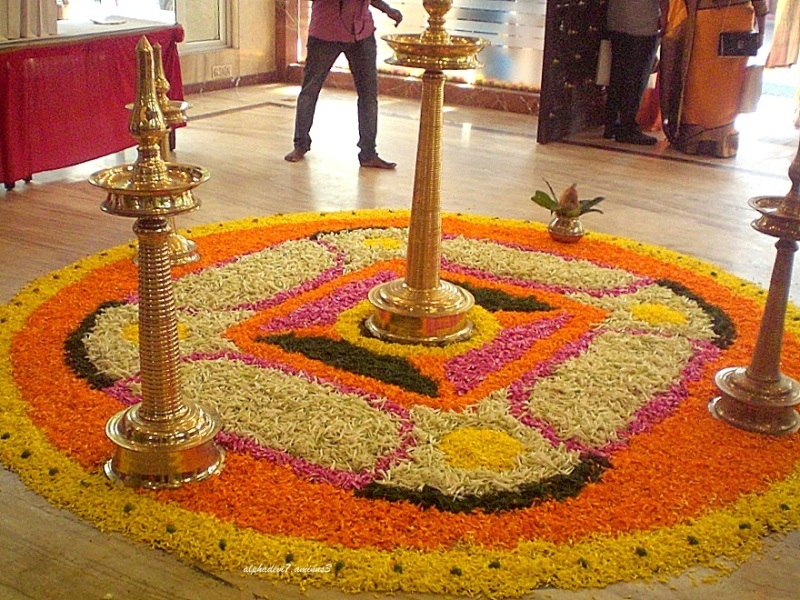 Remember the circular rows of white and blue shankupushpam we used in the PookkaLam ? Quel magnifique travail de décoration au naturel. Très bel effet. We see especially this beautiful carpet of flowers, and not both legs. Oh, what a beautiful floral display!! Great capture! Stunning !! !.Capture D .. I find a quick flash in the eyes usually gets their attention .. This is just beautiful. Such a gorgeous design and incredible colors. A magnificent image! Very beautiful this floral decoration !!! @Harry: Yes..sad it is temporary...to be removed when the petals shrink and fade.. And so right you are about the Sand art too ! I thought it was a rug until I read it's made from petals. Impressive work. A very beautiful floral design. Patience et créativité ! Superbe décor !